The African Water Fern, or Bolbitis Heudelotii, is a robust aquatic fern commonly found in streams and boggy areas throughout Africa. Another common name is the Congo fern, as it is very common in the Congo River Basin. 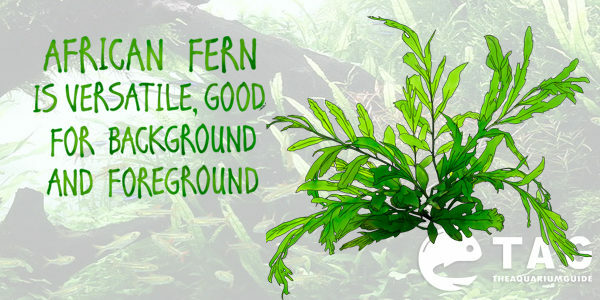 This fern thrives best attached to lava rocks or pieces of wood in water moving areas. With its delicately cut dark green leaves, it grows extremely slow with a single leaf growing in about two months. It can reach a maximum of 22 inches in height and 8 inches wide, depending on the living conditions, with light, nutrients, and CO2 levels being the most important. Being a large plant, the African Water Fern is not suitable for small and Nano tanks. Instead, it will make a great foreground plant in medium tanks or a pleasant accent in large ones. Find out which plants are suitable for Nano Tanks. Water temperatures should be between 74-84 degrees Fahrenheit and in slightly alkaline water with pH between 6.0-8.5 and hardness in the 5-15 range. The Bolbitis is not a plant to just stick in the sand or gravel and watch it grow. Instead, it has to be attached (unless it attaches itself) to a piece of driftwood or a porous rock. You can attach it by using a piece of fishing line, rubber band, or cotton thread. Cotton thread is usually preferred, as it is softer and dissolves over time. The need for attaching the plant to something is the main reason why most dealers will hardly sell a few pieces or why the African Water Fern is not available for shipping, as shipping is usually done by detaching the plant. The African Water Fern’s attachments are very fragile, so handle with care. It will attach best to soft wood and will even make it hard to saw apart. Attachments to hard wood or rocks, though, are superficial; more assertive fish may even uproot the plant. Maintaining this plant is quite easy although its growing rate is extremely slow. It needs a nutrient rich substrate and weekly fertilizing unless the fish produce enough waste to provide the necessary nutrients. CO2 supplements will accelerate the growth rate, especially after establishing in your tank. The African Water Fern requires strong lighting (at least 3 watts per gallon) to grow properly, but you must keep an eye out for algae, as they can be fierce competitors for food, while also preventing the plant from getting enough light. Clean up the algae or place some algae eating fish or shrimp to take care of them. This fern will also survive with less light, but it will hardly grow any further. The Bolbitis will do best in a tank area with currents or medium water movement. It doesn’t tolerate salt, so it should only be grown in freshwater tanks. Always remove dead or unhealthy looking leaves and sections to allow the plant to use its energy only for the healthy segments. Dead plant matter rots and spoils the water, leading to more health problems throughout the tank. Rhizome division, using a pair of very sharp scissors or a razor blade, can help with propagation. The new plant can then be attached in the desired location and will make a nice contrast with older plants, as the young ones are usually bright green, unlike mature ones, which show a dark green coloration. If you consider algae eating fish, forget about the Pleco, as it will eat all the plant down; use Otocinclus or shrimp instead. Goldfish and Koi are an absolute no-no with the Bolbitis, as well as most cichlids, except rams or Kribensis. Silver dollars and Ditto tinfoil barbs are also very likely to eat it, so keep them away from your tank. Provided you place suitable fish that won’t try to graze on it, the African Water Fern’s wide leaves will make a great hideout for small fish that need some privacy or try to run away from harassing fish. Being so difficult to grow and requiring quite a lot of attention, this plant is not recommended for beginners. 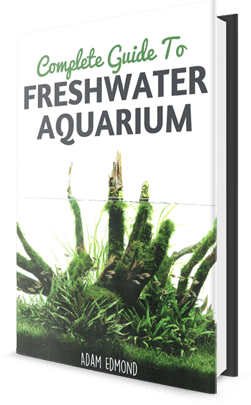 It is also very pricey and hard to find, so no wonder only experienced aquarists who really love how it looks will try to get one and grow it in their tanks.